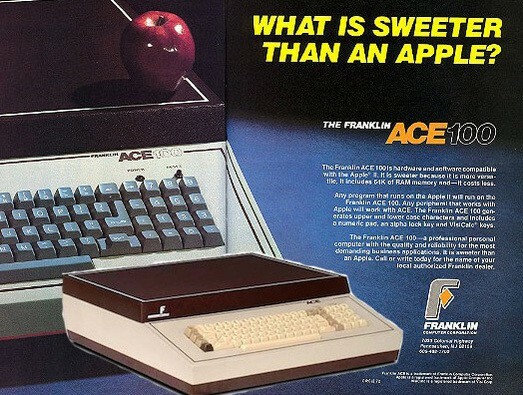 The Franklin Ace 1200 was, in some ways, a literal copy of the Apple II. January 18, 1983: Computer manufacturer Franklin Electronic Publishers takes the wraps off its Franklin Ace 1200 computer, an unauthorized Apple II clone that triggers an important legal battle. Cupertino will soon target Franklin’s line of unlicensed Apple clones with a lawsuit. In the resulting trial, a U.S. court will decide whether a company can protect its operating system by copyright. When the Apple II shipped in 1977, the tech world paid attention. While the computer didn’t turn Apple into a billion-dollar giant overnight, it raked in a massive amount of money: $770,000 in revenue the year it debuted, $7.9 million the year after that, and a whopping $49 million the year after that. Unsurprisingly, other companies sprang into action to follow suit. Some competitors, as seen with the IBM PC, developed personal computers that resembled Apple’s machines only in the sense that they both fell into the same product category. In IBM’s case, its computers clearly targeted the business market. Other companies — particularly those without IBM’s resources — took a more obvious route: ripping off Apple’s revolutionary computer. Franklin Electronic Publishers fell into this second group. Its $2,200 Franklin Ace 1200 computer followed the company’s earlier Apple clones (the Franklin 1000 series). 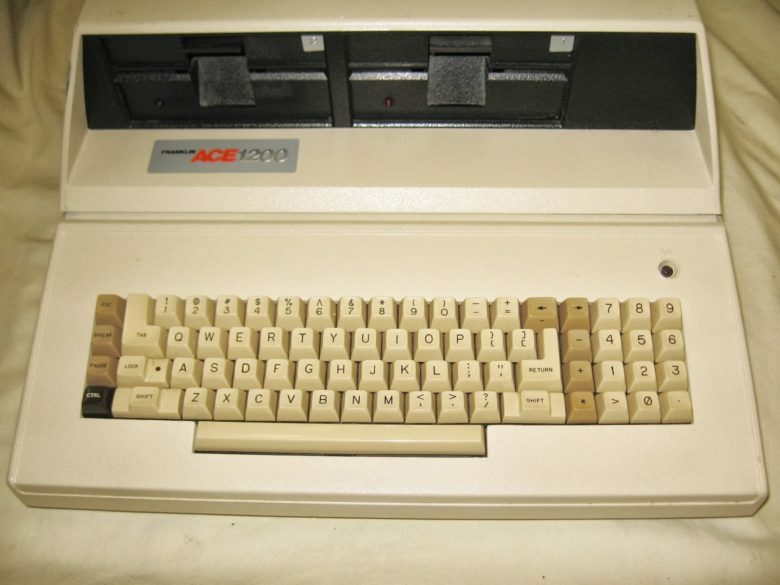 The Ace 1200 was a solidly built machine, boasting a 1 MHz MOS/Commodore 6502 microprocessor, 48KB of RAM, 16KB of ROM and dual 5-1/4-inch floppy drives. The key thing it didn’t have? Apple’s blessing. An ad for an earlier Franklin Apple II clone. Contentious wording much? The contentious part of Franklin’s offering was the company’s decision to copy Apple’s ROM and operating system code. This made the computer compatible with Apple’s DOS 3. It also upset Cupertino. A May 1982 lawsuit filed by Apple pointed out that Franklin’s system included embedded strings containing easter eggs put there by Apple’s programmers — like the name of Apple coder James Huston. Franklin’s lawyers admitted to copying Apple’s software. However, they said that because Apple’s software was readable only by machines, and not something in printed form like a novel, it couldn’t be protected by copyright. Despite an initial ruling in Franklin’s favor, Apple ultimately triumphed in the U.S. Court of Appeals. Franklin was forced to remove its clones from the market by 1988. Apple also added two extra keys to the Apple IIe, so users could easily tell the difference between official Apple computers and clones. Do you remember the Apple II clones of the early 1980s? Leave your comments below.